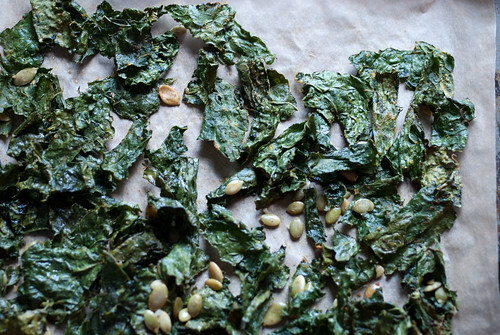 Looking for a nice leafy green to add to your autumn repertoire? Might I suggest some kale? Rich in antioxidants (tons of vitamins A, C, and K), kale is also a good source of minerals, such as iron, copper and potassium. Additionally, it has been shown to help lower cholesterol levels, especially when cooked! 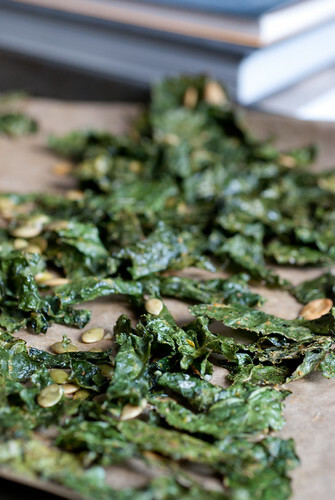 You're probably already somewhat familiar with kale, and if you've spent much time at your local health food store (or health food aisle), you may also be familiar with kale chips! If you've happened to pick up a pack, you may also have noticed their high price. There's a reason for that price--they're delicious! And somewhat addictive. And lucky for your wallet, super easy to make! I like to throw in small amounts of a different spices, and I was recently inspired to throw in some pepitas! 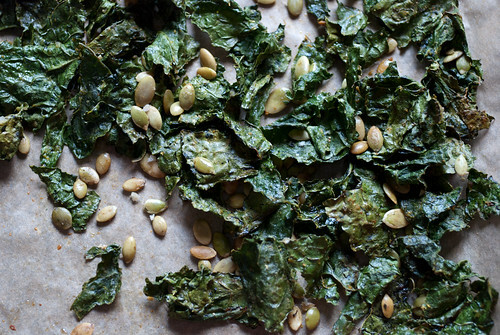 Pepitas (which is just a fancy word for pumpkin seeds), are a great source of fiber, protein, potassium iron and zinc, so they make another healthful (and tasty!) addition to this snack. If you like to save your Halloween pumpkin seeds, here's a creative way to incorporate them into your cooking. Preheat oven to 300F. 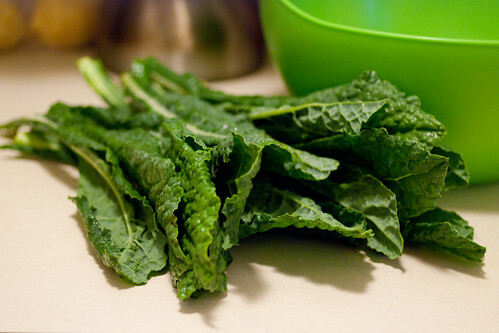 Put the kale pieces in a large bowl, and toss with olive oil. Sprinkle in remaining ingredients, and toss again. Spread them out on a baking sheet covered in parchment paper. Bake for 25-30 minutes, until dry and a bit crispy. Curly kale is usually recommended for making kale chips, but as you may be able to tell from the picture above, I used the more flat-leafed variety for this batch. I've had the curly stuff too, and it is quite good, but I've found that either type works great! Experiment with your own combinations of salt, pepper, and different herbs and spices. It's pretty hard to go wrong!